I had seen the photos of hundreds of people spending the night outside the Apple store waiting for the release of the iPhone 6 so I stopped by the 5th Avenue flagship store at 9 am Saturday morning to do some filming. It was surprising that more than 90% of the people in line wearing warm jackets and sitting in portable chairs were Chinese. They weren't Chinese tourists or Chinese-Americans, but the workers you often see doing the lowest-wage jobs in Chinatown. In fact, they strongly resembled the trafficked workers I've been interviewing in Europe, and were speaking Fujian dialect. 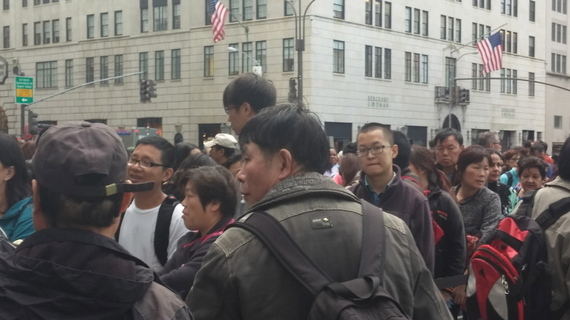 Workers from Fujian have been illegally trafficked into New York's Chinatown for the past 20 years, and many do not speak, read or write English. It seemed strange that low-income immigrants would be the most avid new buyers for Apple's latest release. They often don't even own smartphones. I decided it was in fact unlikely they would be buying these $600 phones for themselves, two at a time and confirmed it through several quick interviews. The waiting line was over a block long and under the watchful eyes of several NYPD as well as uniformed security guards. They seemed to have no idea of the black market operations going on right under their noses. Defying Apple's limit of two phones per person, Chinese "mules" were apparently buying a minimum of six phones, going through the line three or more times Friday and Saturday. The three-month lag in reaching the Chinese market has helped fuel smuggling of about 20 million iPhones into China annually, with iPhones reportedly selling for $3000-$4000 each. Why would people in China choose to pay that much above the retail price? Some Apple devotees want the phones immediately for instant gratification. Others believe that if the phones come smuggled in from the USA they are not likely to be counterfeit. Fake Apple products are widely available and unavoidable in China today. The workers said they had taken the day off to make some cash money -- I estimated they were only making about $25 per phone under the deal they had agreed to. They wouldn't say to whom they would be handing off the phones, but they confirmed the phones would all be sent to China. Several workers offered to sell one iPhone for $100 above the Apple retail price for an instant cash sale. To avoid the police they preferred to do business across the street in front of The Plaza hotel. It seemed they planned to deliver their six or more phones to unnamed buyers. They were watching the police closely, and several workers left when it was announced that Apple was now checking ID's near the entrance. A female worker had a piece of paper she was planning to present at the counter. It said " iPhone 6, 128GB silver" in English and her companion asked if she knew what the piece of paper said. "No, but the Apple employee will" was the reply. Chinese buyers were buying at least 6 phones for re-sale -- which means they had to cycle through the line three times over hours and days. People had taken the day off from work for the opportunity to make cash money above their normal poverty level wages, and they were willing to wait in line all night. Many Chinese working in New York restaurants entered the U.S. through "snakehead" illegal networks. They pay up to $30,000 for snakehead services, borrowing most of the money. Their salary is largely withheld until they've repaid the debt, leaving very little cash to live on. The opportunity to make $100 waiting in line for 24 hours was appealing enough that hundreds of Chinese got online on Thursday night. On Saturday at 6 pm the line was still ½ block long.